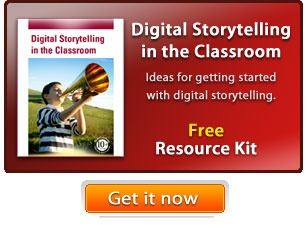 Develop, use, and refine writing and technology skills with students creating animations. Viewing and creating animation is a great way to get today’s media-savvy students interested in the curriculum. Animation is exciting, challenging, and fun to create. In my work as an Instructional Technology Resource Teacher in Manassas, Virginia I have found that building animations is an excellent motivator for students which leads to an engaged learning experience. Studies suggest that computer-based multimedia, such as interactive animation software, can improve learning. The rate of retention using multimedia presentations is improved compared to more conventional modes of teaching (Fletcher, 2003; Mayer and Moreno, 2002). Animation allows students to convey an idea, concept, or thought in a way that words, still pictures, and audio can’t, which helps me find writing projects that work for students at different language levels. As they create at their own level, they enrich their understanding of the content. Animation encourages students to blend informational text, original writing, and illustration making it perfect for learning in Social Studies! For example, students can use animation to recreate important moments in time, such as a famous speech, an important discovery, or an Olympian breaking a record. During the process of animating, students engage with the goals and content of the Common Core State Standards as they read and analyze informational texts, apply research skills, and write information texts, narratives, and arguments for an audience. As they develop the story and script for an animation, students are naturally encouraged to write narratives that include descriptive details and clear event sequences. Storyboards are a necessary part of a successful animation and help my students understand and master sequencing, visualization, details, conflict, and narrative structure. Creating animations that will be shared online provides an authentic audience for student work. When traditional writing is transformed into animation and presented via the Internet to a world-wide audience, the writer has a desire to produce quality work and is excited about the final project. CCSS.ELA-Literacy.CCRA.W.4: Produces clear and coherent writing in which the development, organization, and style are appropriate to task, purpose, and audience. When I ask students to write for a specific audience, such as fellow students, the general public, local community members, or primary-age learners, they must consider how purpose, organization, and word choice can help reach convey a message. Effectively communicating to a specific audience also requires that students have a thorough understanding of the information and events they are sharing. One reason students phone in their school assignments - and only halfheartedly copy edit and research them - is that they’re keenly aware that there’s no “authentic audience.” Only the teacher is reading it. In contrast, academic studies have found that whenever students write for other actual, live people, they throw their back into the work - producing stuff with better organization and content, and nearly 40 per cent longer than when they write for just their instructor. Smart teachers have begun to realize they can bring this magic into the classroom. In Point England, New Zealand - a low-income area with high illiteracy rates - the educators had long struggled to get students writing more than a few sentences. So they set up blogs, had the students post there and, crucially, invited far-flung family and friends to comment. At first, the students grumbled. But once they started getting comments from Germany and New York, they snapped to attention. My students commonly watch BrainPOP videos to learn about topics in their core classes, so this year, I used Tim and Moby as an example of high-quality informational animation. For the first time, students watched BrainPOP videos through the eyes of a "movie maker/animator," studying both animation techniques and effective ways to share information. Students used to passively watching media were excited at the prospect of creating content of their own using. They spent time exploring the features in Frames and then created their own BrainPOP-style Moby and Tim animations to introducing their topics. Once they understood the process of building animation, they began to create animations in others subject areas. I have seen great examples of information writing through animations that explain the water cycle, cell division, historical events and biographical information. They have also extended information writing into how-to videos, teaching others how to paint your nails, fly a helicopter and bake cookies! Student-created animation is a highly engaging activity that inspires students to develop, use, and refine writing and technology skills. Students recognize the legitimacy of the audience for their work and rise to the challenge, using a variety of sources, demonstrating logical reasoning, and exercising effective communication strategies, experiencing the realization that they have a voice and that someone is listening to them. No wonder animation tops the list as my students’ favorite activity each year! Thompson, C. (2013). “The dumbest generation? No, Twitter is making kids smarter.” The Globe and Mail, Friday, Sep. 13 2013. Fletcher, J. D. (2003). Evidence for learning from technology-assisted instruction. In H. F. O'Neil, Jr. & R. S. Perez (Eds. ), Technology applications in education: A learning view (pp. 79-99). Mahwah, NJ: Lawrence Erlbaum Associates. Mayer, R. E. and Moreno, R. (2002). Animation as an Aid to Multimedia Learning. Educational Psychology Review, Vol. 14, No. 1. As an Instructional Technology Resource Teacher in Prince William County Public Schools, Cheryl works closely with librarians and classroom teachers to create effective, goal-directed and appropriately challenging lessons for each grade level. In 2004, she was selected for the Brenton S. Halsey Teaching Excellence Award from the Virginia Historical Society and from 2003-2006 Cheryl represented the Commonwealth of Virginia for the National Endowment of Humanities Grant, Worlds in Motion PBS Series and is proud to be a Star Discovery Educator, Google Certified Teacher, and Tech4Learning Innovative Educator.